Observing that lawyers should not go on strike or give calls to boycott courts, the Supreme Court today gave a months time to various bar bodies including the Bar Council of India to convene a meeting to solve the problem caused by frequent boycotts once and for all. 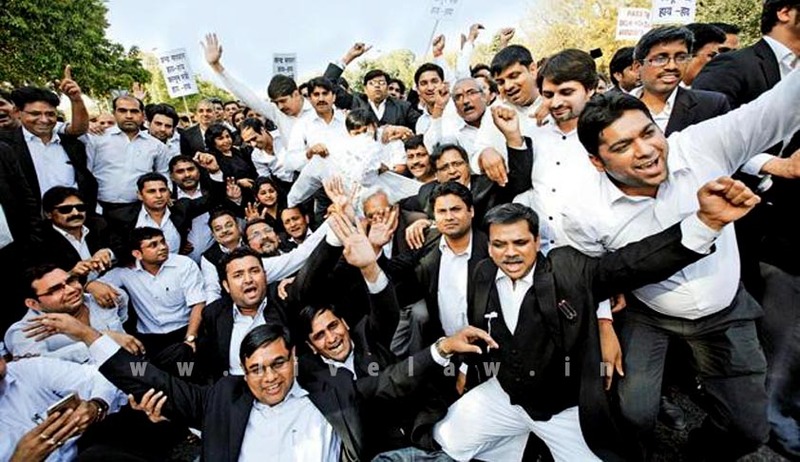 A bench of Justices Kurian Joseph and Arun Mishra said : “Our view is that the lawyers should not go on strike. it's like Brahmastra (weapon created by Brahma). one should use it in a difficult situation, but now a days this is being used frequently. There is also a constitution bench judgment of the Supreme Court prohibiting strike by lawyers. This is a very serious problem, it needs to worked out”. The court's oral observation was made during hearing of a PIL by NGO Common Cause through Advocate Prashant Bhushan, which has approached the apex court against the recent strike of lawyers in the Delhi High Court and District Courts on the issue of pecuniary jurisdiction. Meanwhile, senior advocate Ram Jethmalani, appearing for the Bar, said not to work is also a constitutional right.... He, however, said that we can sit down in the family of lawyers and decide the issue. Responding to this, the bench said that in a months time meeting of the important sections of the Bar Associations be called to see if problem can be sorted out once and for all. The court also directed Chairman of Coordination Committee of District Bar Association, Delhi High Court Bar Association and Bar Council of India to reply to the notices issued to them as to why action for contempt of court should not be taken against them for willful violation of the constitution bench judgement. On Septmber 11, the court had issued notice to Delhi Bar Association, Delhi High Court Bar Association and Bar Council of India asking why action for contempt of court cannot be taken against lawyers bodies for willful violation of the constitution bench judgment of Supreme Court prohibiting strike by lawyers. The notice came on a petition filed by NGO Common Cause whose lawyer Prashant Bhushan brought to the court’s notice recent prolonged strike of lawyers in Delhi High Court and all District Courts of Delhi on the tussle for pecuniary jurisdiction. The strike by Delhi Bar Association and HC Bar Association had paralyzed work in Delhi High Court and subordinate courts in the national capital. Bhushan has sought contempt of court against the two bodies. “We are seeking initiation of contempt proceedings against the respondents for willfully and deliberately disobeying the explicit direction of this Hon’ble Court issued vide judgment dated 17.12.2002 in the above mentioned Writ Petitions (Civil). This Hon’ble Court was pleased to observe lawyers have no right to go on strike nor can they give any call for boycott. This Hon’ble Court has further stated that lawyers refusing to respond to such a call cannot be visited with any adverse consequences by the Bar Association or the Bar Council.” the petition said. “All lawyers must boldly refuse to abide by any call for strike or boycott. No lawyer can be visited with any adverse consequences by the Association or the Council and no threat or coercion of any nature including that of expulsion can be held out.It is held that no Bar Council or Bar Association can permit calling of a meeting for purposes of considering a call for strike or boycott and requisition, if any, for such meeting must be ignored. It is held that only in the rarest of rare cases where the dignity, integrity and independence of the Bar and/or the Bench are at stake, Courts may ignore (turn a blind eye) to a protest abstention from work for not more than one day.”, Bhushan's petition said. “It is being clarified that it will be for the Court to decide whether or not the issue involves dignity or integrity or independence of the Bar and/or the Bench. Therefore in such cases the President of the Bar must first consult the Chief Justice or the District Judge before Advocate decide to absent themselves from Court. The decision of the Chief Justice or the District Judge would be final and have to be abided by the Bar. It is held that Courts are under no obligation to adjourn matters because lawyers are on strike.On the contrary, it is the duty of all Courts to go on with matters on their boards even in the absence of lawyers. In other words, Courts must not be privy to strikes or calls for boycotts. It is held that if a lawyer, holding a Vakalat of a client, abstains from attending Court due to a strike call, he shall be personally liable to pay costs which shall be addition to damages which he might have to pay his client for loss”, said the plea.